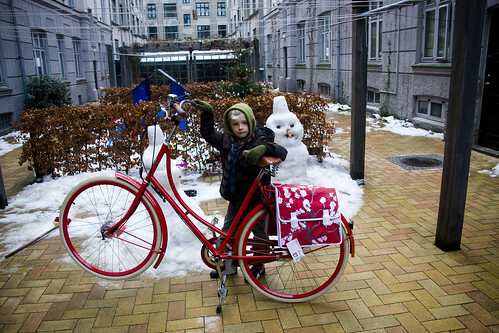 Rest assured, the winner of the Cycle Chic/ Velorbis Climate Conference Gorgeousness Competition has contacted us. Lauren, from San Francisco, will be in Denmark for a while and the logistics of getting the Velorbis Studine bicycle to her were tricky, so we're going to do it after New Years. In the meantime, Felix and I picked up the bicycle from our friends at Velorbis yesterday and the fine bicycle will be parked in one of our bicycle sheds until which time Lauren will take possession of it. And isn't that a cool snowman we made?! Merry Christmas and a Joyful New Year to you and yours. Thought I saw the bike parked across the street from my office near Levi's Plaza in San Francisco today. Did you manage to cross paths already? Great giveaway idea -- hope you'll do more. Happy New Year! looking forward so much to becoming one with my Studinealiciousness!! see you in 2010, happy new year everyone!